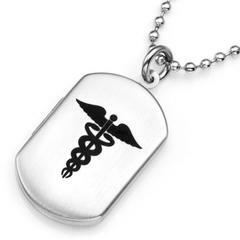 Our medical ID stainless steel dog tag locket has a polished finish on the front and a brushed finish on the back and holds two 1/2 x 3/4 inch photos. It can be engraved with up to 5 lines on the back with emergency or contact information. Photos are secured by plastic insert and snap-in protector frame. Locket Dimensions: 1 1/4 x 3/4 Inch. This comes with a standard 30 inch stainless steel bead chain which can easily be cut to your size.